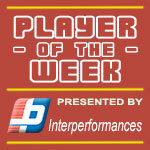 Naturalized American Forward Ricardo Ratliffe (203-F-89) had a very impressive game in the last round for top-ranked Mobis Phoebus, receiving a Interperformances Player of the Week award for round 30. The 29-year old player had a double-double of 35 points and 19 rebounds, while his team crushed KT Sonicboom (#3, 22-17) with 23-point margin 95-72. The game was between two of the league's top four teams. 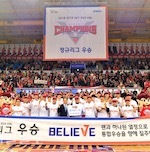 It allowed Mobis Phoebus to consolidate first place in the South Korean KBL. They would have been even better if they hadn't lost a few games earlier this season. Mobis Phoebus has a very solid 30-10 record, but they cannot be too comfortable about keeping top position. Ratliffe turned to be Mobis Phoebus' top player in his first season with the team. Ricardo Ratliffe averages this season 24.4ppg and 14.7rpg. 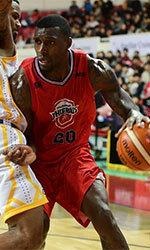 The second best player in last round's games was 32-year old American Leon Williams (203-C/F-86) of DB Promy. Williams had a very good evening with a double-double of 26 points and 19 rebounds. It was enough for DB Promy to edge the lower-ranked Samsung Th. (#10, 10-30) 79-74. Despite this victory DB Promy slide down in the standings to 7th position. His team is not often considered as one of the league's best with a mere 19-21 record. Williams is a newcomer at DB Promy, but is already one of team's top players. Third on the list of top players last round was Canadian guard Justin Edwards (190-G-92) of Anyang KGC (#8). Edwards got into 30-points club by scoring 38 points in the last round. He went also for five rebounds and four assists. He was a key player of Anyang KGC, leading his team to a 102-71 easy win against slightly higher-ranked DB Promy (#7, 19-21). The chances of Anyang KGC ranking at the top of the league, however are very questionable as they have already lost 22 games, recording just eighteen victories. With bigger assistance of his teammates, Edwards could help Anyang KGC to bring them higher in the standings. Edwards has a very solid season. In 21 games in South Korea he scored 14.7ppg. He also has 4.0rpg and FGP: 53.9%.